The Ener-Core Gradual Oxidizer is a technological innovation which may enable use of the widely varying range of fuel gas sources around the globe. Its intended operation range spans from 2600 Btu/scf down to 15 Btu/scf, meaning it is designed to successfully handles high-Btu gas with no oxidation acoustics as well as ultra-low Btu gas. 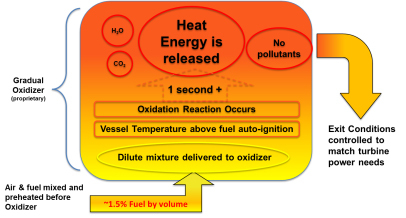 The Gradual Oxidizer is also intended to accept varying fuel qualities during operation, making it adaptable not only to different gas sources, but also to the natural variations within each of those gas sources. Oxidation is a chemical process where fuel reacts with oxygen. Oxidation can happen quickly or slowly. For example, vented methane oxidizes with atmospheric oxygen at very low concentrations. Over the course of years, methane oxidation eventually results in CO2 and H2O. The Ener-Core Gradual Oxidizer is designed to control the oxidation process so that the reaction time and heat release are high enough to power a gas turbine, while the associated temperature remains low enough to avoid the formation of NOx. The Ener-Core Gradual Oxidizer is engineered to precisely control the gas feed rate to maintain temperature control needed to continuously power the gas turbine generator. Ener-Core’s patented Gradual Oxidizer is designed to operate on a wide range of fuel qualities and to overcome the acoustic and stability limitations associated with traditional technologies. The Gradual Oxidizer is intended to allow for wider fuel flexibility than conventional reciprocating engines and gas turbines.